I never realized how short my fuse was until I had children. In an instant, I can go from being the mom I want to be, to becoming an exasperated, screaming monster. How does that happen? In my frustration and impatience, I have succumbed to my most primitive reaction, and in doing so, have shown my children that they are not worthy of my patience and that I am not in control. This behavior is unacceptable. We parents love our kids, right? So why wouldn’t we want the very best for them? Often, it is out of this sentiment that we behave so poorly. In an effort to get them to behave or teach them something new, we lose our cool, because they are whining, making a mess, or aren’t paying attention. Instead of providing the best example for them, in flash of anger, we tear down their self-esteem and show them the opposite of love. Every human has these moments, and it’s perfectly normal, but if you find yourself in a constant state of yelling, hair-pulling, or getting disgusted with your children, it may be time for a time-out. When our children are born, we have two responsibilities: to keep them alive and to keep them safe. Although babies seem needy, they really don’t need much. They need love. But love is a tall order. It is constant, and they require it unconditionally. One of the ways we show them love is through keeping them safe. When children feel secure, they typically grow up to be well-adjusted people who are capable of forming deep bonds with other people. In the psychological world, we call this attachment. In infancy, that is the main task of human development, to build secure attachments. That’s why it is so important to respond to babies when they cry and try as best as you can to meet their needs. That’s also why it’s important not to make them fearful with your anger. Remember, love is patient. Researchers have discovered that children who live in environments where anger is a constant expression typically demonstrate less empathy than their counterparts. They are also more likely to act aggressively, develop depressive symptoms, and have difficulties in school. They see your inability to control your emotions, and so they never learn to control their own. This behavior hinders personal growth and their ability to adapt to different situations. We teach our children a not-so-valuable lesson when we use anger as our default setting: It’s okay not to control your emotions. 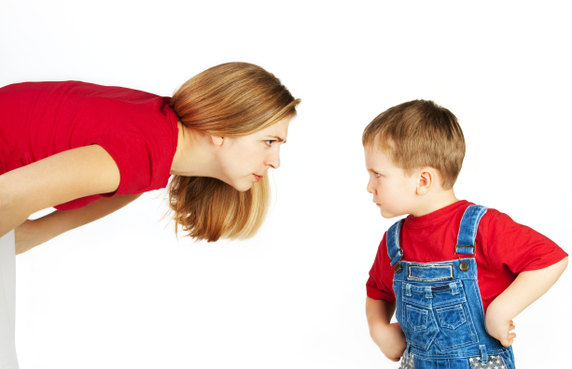 Typically when we get angry at our children, we are reacting to situations that are embarrassing, nerve-wracking, or exhausting. Our attempt to control our children’s behavior is really our desire to control our own. We want to eliminate shame, anxiety, and fatigue, so we try to make them change. But instead of using calmness and patience to teach them to control their own behavior, we use manipulation to force their wills. This “technique” doesn’t work, and it makes you look ugly (especially in public). I didn’t like the way I was acting toward my oldest toddler (yes, I have two of them). Every day, I woke up prepared for battle, and his bedtime prompted relief. That is no way to live. In a search for ways to “make” him behave, I realized that I was the one who needed to make a change. What worked for me was the “1-2-3 Magic” method, by Thomas W. Phelan, Ph.D. This method is simple and uses counting to stop offenses rather than arguing. The concept works on the premise that children, especially very young children, have no idea what you’re talking about when you yell at them. They are inexperienced in the world, and they are not adults. Our adult brains cannot fathom this truth, and so, we continue to try and negotiate with them as if they are. Instead, when they do something you want them to discontinue, simply count to 1 (I say “That’s 1”). When the behavior continues, count to 2, and then eventually 3. At 3, give them a timeout. It seemed simple enough. As I began to practice this method, however, a personal transformation occurred. Overall, I became calmer and approached my child’s misbehavior from a new perspective—one of a loving and sympathetic parent. This method may not work for everyone, but everyone should find a method, regardless. The peace and calm you will experience by changing your approach will permeate your entire demeanor. Believe it or not, the calmer you are, the calmer your kids will be. Step 1: Make a plan: Now that you’ve accepted the fact that you need to develop into a more compassionate and calm parent, you need to make a game plan. It is in those moments of outrage that you lose control. If you have a plan, it will be easier to react accordingly, as opposed to spontaneously. Step 2: Share your plan: Tell your ideas to a spouse, partner, grandparent, teacher, and other caregivers. It truly does take a village to raise a child, and consistency will give your child security and reinforcement. Step 3: Educate yourself: Try to understand the psychology of children, at every developmental stage. Remember that children do not have the experience you do, and everything they do is an experiment. If you can empathize more with them, you may realize how confusing and frightening the world can be to young people. You were young once, too, right? Step 4: Expect misbehavior: Your kids are going to act up. Your reaction is a big experiment. They are constantly testing their boundaries. If you don’t give them the explosion they are looking for, their behavior may improve. If they continue to act up even after calm correcting, you may try to figure out if something bigger is going on. Step 5: Focus on personal development: This situation is just as much about you as it is about your kids. Be present in their lives. There is a time for chores, but there is also a time to play and interact. Don’t over parent. Give kids the freedom to make mistakes, and help them make sense of the outcome. Let go of minor misdemeanors. Ask yourself, is it worth saying anything? Breathe, think, and breathe again before you react. Cultivate personal growth, independent of being a parent. Remember, you are an individual with needs. Nurture them. Above all, teach your children. That’s what this is all about. You are their worlds, and they need you to guide their way.